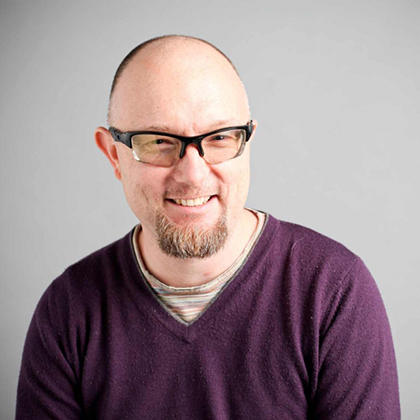 Karl Cresser is a Specialist Technician at London College of Communication, supporting students across the film, television, documentary and live events courses. He manages, maintains and teaches in the TV studio. Karl is a freelance steadicam and camera operator with a varied background in film camerawork, animating for TV, music promos and commercials, and directing funded short art film projects to corporate live events. As a filmmaker and animator Karl has worked on various commercials, promos and comedy television shows. Past work includes Sucked Up for Channel Four, broadcast in 2003, and screened at Edinburgh and Oberhausen Film Festivals amongst others. Sucked Up was shortlisted for a British Animation Award Films at the Cutting Edge. Karl's practice often involves misusing technology for psychoanalytic and gender research. He studied Film at WSCAD Farnham, specialising in directing and 16mm cinematography. Karl also completed a drama direction course at the National Film and Television School (NFTS) and holds a postgraduate certificate in film production at UWCC.